Black seed, considered to be a magical seed, is truly one of the most powerful seeds. In Islam it is believed to be a cure for all diseases except death and is called ‘the blessed seed’ in the Middle East. It has many other names viz. black cumin, roman coriander, onion seed and black caraway. It resembles the shape of a sesame seed, and is commonly used as a spice in Indian, Pakistani, Persian and Middle-eastern cuisines. The chemical composition of the black seed is proved to be very rich and very diverse. The black seed is suggested to have been used as early as the 5th century B.C. by Hippocrates and a few others. It was also claimed that a bottle filled with black seeds was found inside the tomb of the Egyptian King, Tutankhamen. The black seed oil is derived by pressing the seeds, this nutrient rich oil contains about a hundred healing components, and each component works together with the other components to aid the body in maintaining an overall aspect of well being. Research shows that this is possibly the only herb with such an extensive range of healing properties. Black seed oil comprises two major components, one is nigellone and the other is thymoquinone. The first component helps with respiratory ailments, at the same time acting as an antihistamine. The second contains anti-inflammatory substances along with being an anti-oxidant which helps in cleansing the body of toxins. Since ancient times, black seed and its oil are being used to cure a wide range of ailments. 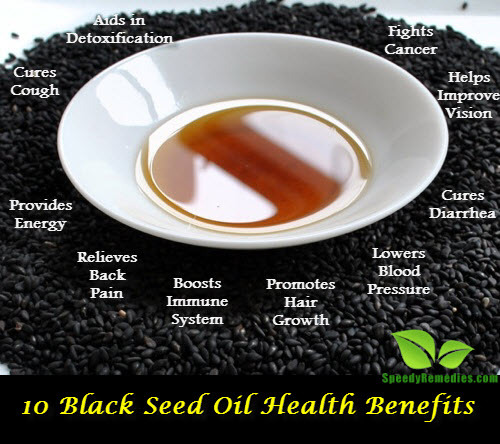 Here are ten of the many benefits of black seed oil. Black seed oil has the capacity to support and improve a weak immune system, enabling it to fight infections and irritants that may cause allergies. To boost the immune system, one teaspoon of black seed oil should be taken in the morning and at night. For relieving symptoms of allergies, half a teaspoon of black seed oil can be taken when indication of an allergy occurs. For overall good health, it is essential that the body is free from toxins, and black seed oil helps in achieving just that. It has the unique ability to cleanse the digestive system as it has a strong anti-oxidant power. For this purpose, one teaspoon of black seed oil can be consumed both in the morning and at night, with or without honey. Black seed oil has anti-bacterial and anti-inflammatory properties, both of which help in treating ailments like asthma, cough and fever. For relief from asthma, a teaspoon of oil should be added to boiled water and the resultant vapors should be inhaled, twice a day. For cough, a teaspoon can be added to tea or coffee, or half a teaspoon can be rubbed onto the chest. At the onset of fever, take one teaspoon oil when needed; it will induce perspiration and hence, offer relief. Black seed oil is said to improve vision and also treat other eye infections. For this purpose, the oil needs to be rubbed onto the eyelids and on the sides of the orbit before going to bed. It is also suggested that to take a glass of carrot juice mixed with half a teaspoon of this oil. Take this remedy once a day. Due to its healing and anti-inflammatory properties black seed oil helps provide relief from back pain, when warmed up and applied to the affected area, massaging it in thoroughly so that it can penetrate the skin as far as possible. Black seeds are rich in polyunsaturated fatty acids along with protein and carbohydrates, which aid in regulating the metabolism, improve circulation and balance insulin levels in the body. To feel fresh during the day, a teaspoon of black seed oil can be added to a glass of orange juice and had with breakfast; for a good night’s sleep a teaspoon of the oil can be added to a hot drink and consumed after supper. Black seed oil is said to be very useful for stimulating hair growth and preventing graying of hair. To use it for this purpose, the oil can be added to the shampoo or massaged into the scalp after washing the hair. As it has been mentioned earlier, black seed oil has many powers, some of which are yet to be discovered. For example, it is believed to help lower blood pressure, by adding half a teaspoon of black seed oil to water and drinking it first thing in the morning before having anything else, it can prove to be an all natural remedy for this ailment. It is also recommended that a few cloves of garlic also be consumed daily along with getting plenty of sunshine. An upset stomach or diarrhea is an awful feeling making the person feeling completely drained of all energy. To treat diarrhea one teaspoon of this oil can be mixed with yogurt and had twice a day. Half a teaspoon of black seed oil when combined with half a teaspoon of fresh ginger juice and consumed twice a day is said to provide much relief from vomiting and an upset stomach as well. To cure a headache the oil must simply be massaged into the temples, forehead and inside the nostrils. Black seeds are said to be a miraculous cure for cancer in the earlier stages. Pancreatic cancer has been specifically mentioned to have been treated by the use of black seed oil. The inert property of the seeds help in killing the cancer cells and hence, preventing them from spreading. To conclude, it can be said that indeed the black seed is a vitamin of life. And finally to cure a disease also requires faith in the methodology used for the treatment. This oil is Natural oil.It`s a very usefully product. wao this is a nice piece;i will try it for back pain;what about general joints pain?same application with back pain?have a great time. can we give black seed to children of 2 years ?